Sonoma State University sports update, November 3-8. Women's Volleyball extends win streak to eight; women's soccer exits CCAA Tournament early and earns No. 3 seed in the NCAA Division II Tournament; men's soccer earns No.4 seed in the NCAA Division II Tournament; women's basketball starts exhibition season; men's basketball starts their exhibition matches against Division I teams; cross country ends season in NCAA Regional Invite in Montana; baseball brings former MLB players to baseball camp. 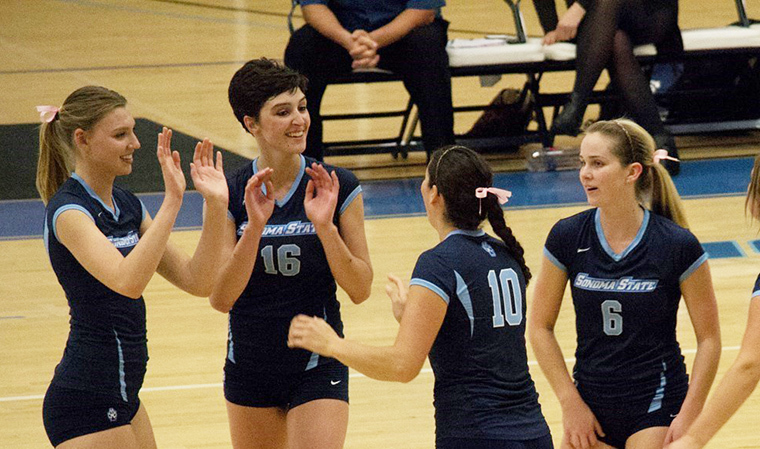 Senior Night was a sweet one as Sonoma State swept Humboldt State in three sets to extend its winning streak to eight. The Seawolves are now 12-4 in the CCAA, 14-9 overall. The three seniors honored on Nov. 5 were Rachel Andrews, Emily Papale, and Alexandra Flores. Andrews currently leads the CCAA in hitting percentage (.386). It was a team effort that helped Sonoma State sweep the San Francisco State Gators Nov. 2 in the Wolves' Den. Seven Seawolves contributed kills and 10 contributed at least two points in the match. Courtney Seda and Baelei Wiesner boosted the Seawolves to a team hitting percentage of .311. The Sonoma State women's soccer team has earned an at-large bid into the 2016 NCAA Division II Soccer Championships, securing the No. 3 seed in the West Region for its fourth NCAA tournament appearance in the past five seasons. The Seawolves (12-2-3) will head to La Jolla on Nov. 10, matching up with No. 6 seed Azusa Pacific (11-3-4) in the First Round and the winner will advance to the Second Round on Nov. 12 against host and No. 2 seed UC San Diego (18-2-0). Despite holding an 18-5 shot advantage through 110 minutes of scoreless play, the Sonoma State women's soccer team was eliminated from the 2016 CCAA Women's Soccer Tournament after CSU Los Angeles won 3-2 in penalty kicks on Nov. 4 at Warrior Stadium in Turlock. The No.19 Seawolves move to 12-2-3 overall and will now await the Nov. 7 announcement of the 2016 NCAA Division II Women's Soccer Championship Tournament field. Sonoma State entered the weekend as the No. 3 team in the West Region and will need to remain in the top six to qualify for a NCAA postseason berth for the fourth time in five seasons. Six Sonoma State women's soccer student-athletes were selected to the 2016 California Collegiate Athletic Association (CCAA) Women's Soccer All-Conference Teams, led by the Seawolves' lone First Team selection, sophomore midfielder Miriam Bloom. Also earning recognition was junior forward Sara Van Wagoner and junior defender Cecilia Sifuentes, both selected to the Second Team, while junior forward Katie Mohr and senior midfielders Taylor Enzler and Madison Minton grabbed Honorable Mention nods. Bloom captured her second All-CCAA award in as many seasons. Hailing from Encinitas, California, Bloom is tied for second on the team with 10 points, netting two goals and assisting on six others. She earned All-CCAA Second Team honors as a freshman last season. The Sonoma State men's soccer team has earned an at-large bid into the 2016 NCAA Division II Soccer Championships, securing the No. 4 seed in the West Region for its first NCAA tournament appearance since 2010. The Seawolves (10-4-5) will head to Seattle, Washington on Nov. 10, matching up with No. 5 seed Cal Poly Pomona (12-5-2) in the first round. Eric Alvarado connected on his fourth penalty kick of the season late in the first half to put the Sonoma State men's soccer team up 1-0 late in the first half, but top-seeded UC San Diego rallied for the equalizer midway through the second half and scored the game-winner three and a half minutes into overtime to capture the 2016 CCAA Men's Soccer Tournament title on Nov. 6 at Warrior Stadium in Turlock. Andrew Ogilvy connected on his fifth goal of the season just 12:15 into the contest and then assisted on Daniel Theobald's strike with less than two minutes remaining in the contest to secure the Sonoma State men's soccer 2-0 victory over Cal State Los Angeles in the Nov. 4 CCAA semifinal at Warrior Stadium in Turlock. Senior midfielder Armando Coronel earned California Collegiate Athletic Association (CCAA) All-Conference First Team honors on the 2016 CCAA Men's Soccer All-Conference Team. Also earning All-CCAA recognition were senior midfielder Jose Avalos and junior defender Eric Alvarado, both grabbing Second Team nods, while junior goalkeeper Mitch North and senior defenders Ryan Rohane and Dane Shaffer were Honorable Mentions. The Seawolves won their home exhibition match against the Pioneers of Pacific Union College, 84-49. Helping Sonoma State to their victory was Kylie Kiech with team highs of 19 points and nine rebounds, Carly Gill with 12 points and seven rebounds, six of which were defensive, and Kim Savio with 10 points. Three Sonoma State men's basketball players scored in double figures and the Seawolves got to within 10 points with just under four minutes left in the contest, but NCAA Division I UC Irvine pulled away late for the 81-63 win in an exhibition game at the Bren Events Center on Nov. 5. Luke Cochran led Sonoma State with 15 points, Jimmy Golden added 12 and Naaman Hightower snared a game-high nine boards. Ronnie Harris came off the bench to add 11 points, three assists and one steal, connecting on all eight of his free throws. The Sonoma State men's basketball team opened up its exhibition season on Nov. 4 with an 80-50 loss to Division I Loyola Marymount, a member of the West Coast Conference. Jasmine Casillas led the Sonoma State women's cross country team across the finish line, placing 67th overall as the Seawolves finished 25th out of 30 teams at the 2016 NCAA Division II Cross Country West Region Championships on Nov. 5 at Amend Park in Billings, Montana. Analicia Garcia finished in 77th overall. Former San Francisco Giant Royce Clayton and five-time All-Star Andruw Jones highlight an impressive lineup of big league talent that will speak at the Sonoma State Baseball Camp and Clinic on Dec. 3 at the Seawolf Diamond. In addition to Clayton and Jones, the event will feature Jeff Weaver, Fernando Vina, and athletic performance consultant and author Duke Zielinski. In addition to the speakers, a kids camp will be held from 9 to 11:45 a.m. for players ages 10-17. The camp and clinic costs $175 and individuals can register at sonomaseawolves.com.